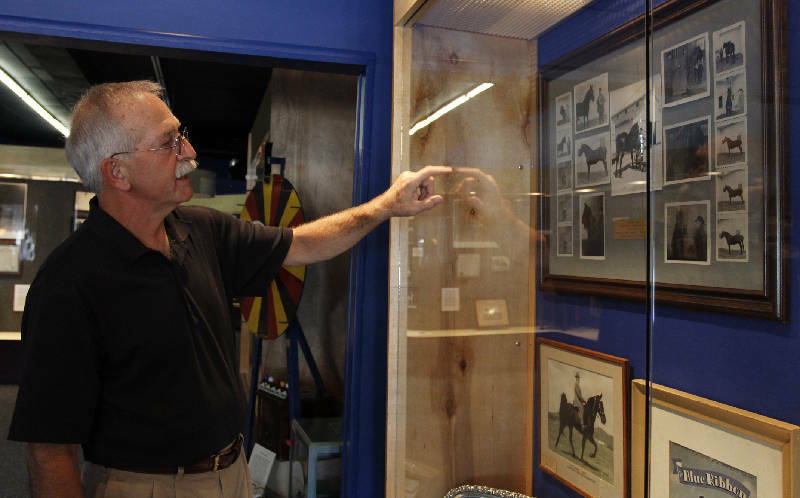 Phillip Gentry, president of the Tennessee Walking Horse National Museum, explains the historical significance of some of the photos in a display case at the Tennessee Walking Horse National Museum in Wartrace, Tenn., on Thursday. The photographs trace the history of the Tennessee Walking Horse's prominence from the early twentieth century to the present. Photo by Alyson Wright /Times Free Press. * Where: 27 Main St., Wartrace, Tenn.
WARTRACE, Tenn. - Tiny Wartrace long has been known as the cradle of the Tennessee walking horse industry. Now it also is the new home of the Tennessee Walking Horse Museum, an addition to the town that was home to Strolling Jim, the first champion Tennessee walking horse. Tucked into one of downtown Wartrace's historic storefronts, the museum is larger than City Hall next door. But then, City Hall doesn't have to be too big in a town with a population of about 900. Philip Gentry, president of the Wartrace Chamber of Commerce and the museum's director, said the move marks the museum's renewal. The museum first began as a room in the Calsonic Arena, home to the Tennessee Walking Horse National Celebration show in Shelbyville, Tenn., then in the 1990s was moved to Lynchburg, Tenn., near the Jack Daniel Distillery. But with recession slowing tourism, the museum had been closed since about 2005. "Everybody has always said it belonged in Wartrace because Henry Davis and Floyd Carothers here were the ones who started the Celebration, but there was never something going on that made it happen," Gentry said. In 2010, officials at Jack Daniel wanted to use the space where the museum was sitting dormant. Gentry and other supporters went to work, and this summer the museum in Wartrace opened on the weekend of the Wartrace horse show in early August. But it's real grand opening was during the Celebration, which ends its two-week run tonight. Gentry and the museum supporters also are broadening its displays of Tennessee walking horse memorabilia beyond the traditional perceptions of high-stepping champions and the Celebration. "Our intention is to focus on the Tennessee walking horse, not just one discipline," Gentry said of the versatile horse breed known mostly for its padded, high-stepping gait. "I've got a display over here where a lady won the extreme cowboy world championship on a Tennessee walking horse. You wouldn't find that anywhere else. But she was riding a Tennessee walking horse," he said. "Nobody thinks of this," he said pointing to that display. "And that's what we want to change." Volunteer Peggy Payne points to a new display of the horse Shakers Shocker and Betty Sain, the first woman to ride a horse to a world grand championship in 1966. "She was just here a few days ago to bring us some items to display," said Payne, glancing at Sain's signature on the museum guest book.